A twist on the classic red wine based sangria, this rose sangria is perfect for an afternoon with friends. We are on the cusp of spring and I couldn’t be happier. The days are longer and also warmer, which means my drink of choice is changing from heavier cocktails to brighter, fresh libations. I was once in winter hibernation but now I’m ready to catch up with friends – and what could be better than chatting over rose sangria. Like everyone else it seems I adore rose wine. Even my favourite author Ernest Hemingway loved Spanish rose. It was my drink of choice to beat the heat in Charleston and some restaurants had it by the glass or on tap! And while I thought last year was the summer of rose I’m extending it to this year as well. Rose deserves more than just one year. You may be surprised that I would take a wine I love and turn it into sangria. Sangria is known to mask poor quality wine with fruit, sugar and liqueur. Sure there’s merit to that reputation. I think we’ve all tragically ordered a pitcher of sangria from a crappy Irish pub. After a few sips your teeth feel like they are rotting, just like the orange slices in the plastic pitcher. Let’s not do that anymore, k? Just as you should only cook with wine that you would drink, you should only use good wine in sangria. After all it’s the base flavour, so why start with something bad and then spend the rest of the time masking its flavour. Rose is fresh, bright and perfect for afternoons in the sun. If you like your friends spend the extra few dollars and choose a quality rose. And if you love your friends also keep a second bottle chilled as the best afternoons run into early evening and you’ll want more. 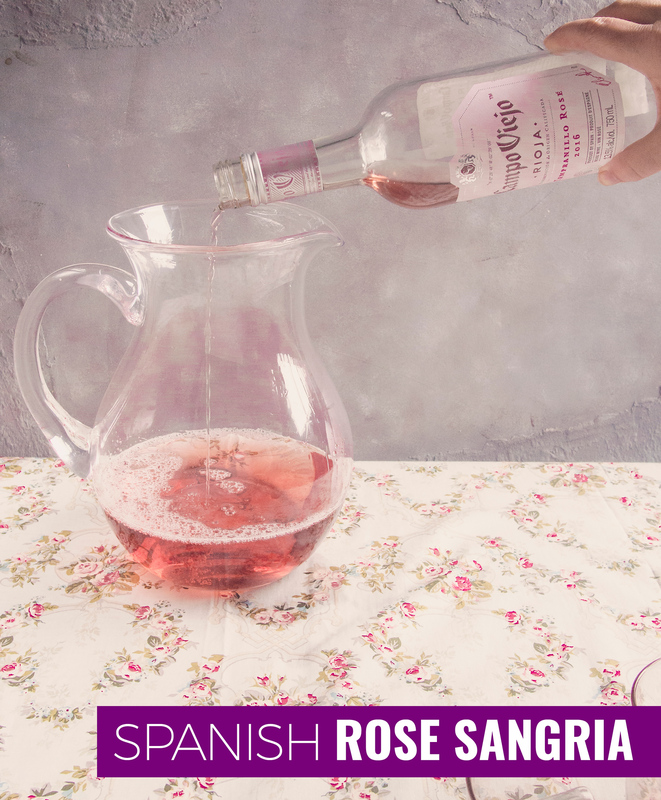 This rose sangria is not traditional. The original sangria uses red wine from Rioja in Northern Spain . However, this recipe isn’t completely blasphemous as I’ve chosen CV Tempranillo Rose, which uses the same tempranillo grape from Rioja, Spain. The grape is the same but the process of making the wine is different. It’s good enough to drink on its own (remember I said you may need that second chilled bottle) and retails for $11.95 which is very reasonable. It’s a great afternoon wine and a good candidate for sangria as it’s medium bodied with 14% alcohol so it can stand up to other flavours in the sangria. I guess you could call this rose the younger sibling of the mighty Rioja wine. As a rule I prefer drinks to be tart and refreshing. 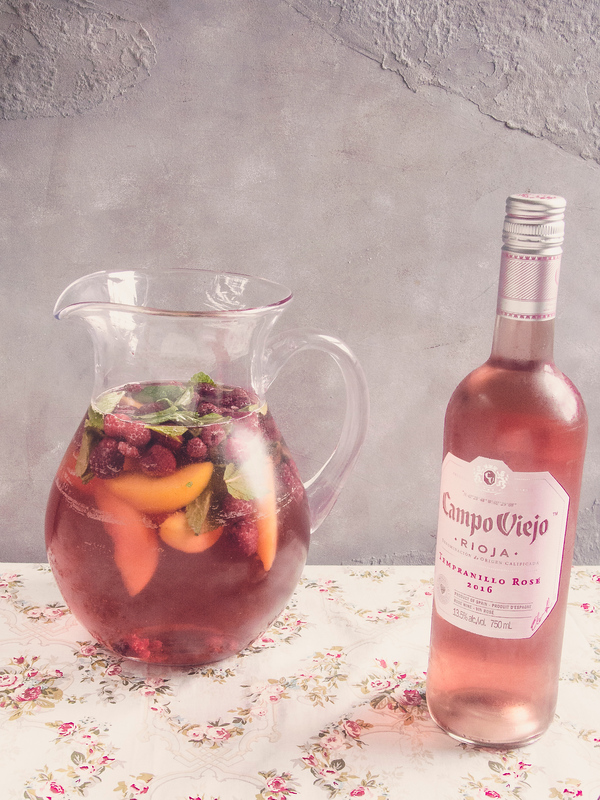 This rose sangria builds on the berry flavours from the CV Tempranillo Rose, but instead of sweet strawberries I’ve opted for tart raspberry, peach and Triple Sec balanced with just a bit of simple syrup and soda water. This isn’t your Irish pub sangria. Pour CV Tempranillo Rosé into a pitcher. Add Triple Sec, sparkling water and fruit. 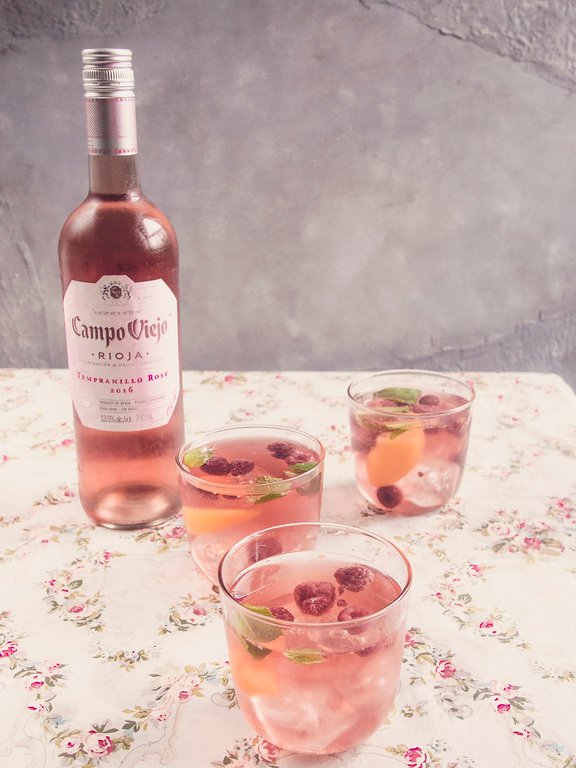 Chill for a few hours and then taste for sweetness as the fruit will naturally sweeten the rose sangria. If needed add simple syrup. If it's too sweet add ice. Never ever invite friends over for drinks unless you have food as well. Even if everyone pretends they aren’t hungry eventually they will eat. Be prepared but don’t stress. Spanish wine is versatile and easily enjoyed with food. Sangria is casual and unfussy, and so should be your focus on wine pairing. I love tapas style entertaining so people can pick at food, think salty and spicy. 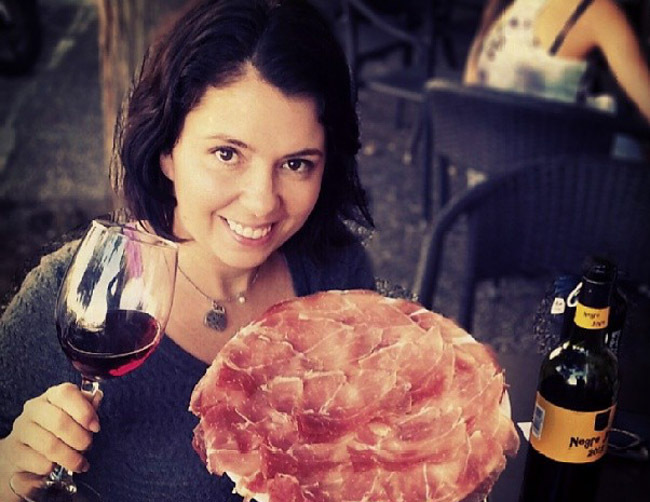 Cured meats like Spanish jamón are easy, as are olives, grilled vegetables or pan con tomate. If it’s lunch/brunch think about light pastas with spicy shrimp, a vegetable quiche/Spanish omelette and you can’t go wrong with the traditional dish of Rioja – chorizo. It may seem counterintuitive but rose, and this rose sangria, balances out salt and spicy flavours. It’s your turn: share your favourite sangria recipe in the comments below. Disclosure: This rose sangria post is in partnership with Pernod Ricard. I reached out to them as I wanted to use Campo Viejo rose for all the reasons I listed above and they were kind enough to sponsor this post. It’s because of great sponsors like these that I’m able to run this website and have afternoon rose sangria with friends. Rose is my favourite warm weather wine. This sangria looks so refreshing, I love the addition of triple sec! And you’re 100% right that friends who “aren’t hungry” always end up eating! Oh yes please!!! I love the idea of using a Rose in the sangria instead, and all of that fresh fruit tops it off perfectly. Great drink for the warm weather ahead!! Love the fact that you’ve used a good-quality wine and balanced it out with tart berries… that sounds so much better that the sickly-sweet pub sangrias I used to order in my younger and less discerning days! I’ve found sangria to be so hit and miss. Sometimes it’s lovely, and sometimes it tastes like a cross between cherry cough syrup and a Jolly Rancher. I like this idea of using rose though! I’ll have to give that a try this summer. 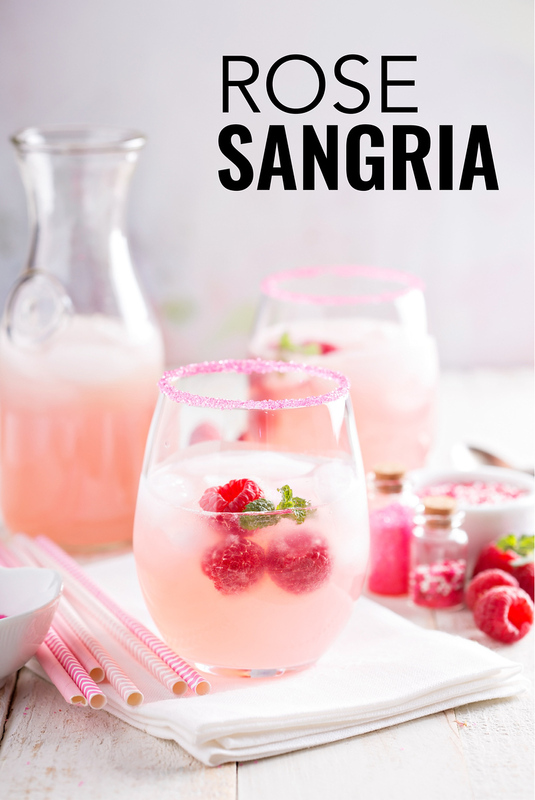 I have actually tried to make several sangria recipes at home and never was completely happy with the end result- so this is something I will def try! Pinned for later!! I like sangria with red wine. I like sangria with white wine. So why not sangria with rose? I’m game to give it a try! This looks gorgeous and sounds delicious! I’ve never been a fan of sangria in bars because it’s always so sweet and the sugar hangover is worse than the wine — will definitely be trying this the next sunny afternoon. I love a summer sangria and your rose version is just stunning. Cheers! I ADORE rose wine too Ayngelina. But not the sickeningly sweet pop stuff. Real good stuff. Like Spanish rose. Dry, elegant, fruity. Like you say about having a decent sangria, I’m of the firm opinion we need good rose too. I love that this recipe isn’t super sweet. Bring on the pitcher(s)! I totally agree! You need a wine you could drink by itself to make sangria, maybe not a Chateau d’Yquem… but a low cost good wine! I love the peaches in there makes it feminine, perfect for a girl night! Rosé all day! I love this idea for a rosé sangria – it will be perfect to serve at my next patio party! I’m such a huge fan of rosé (been drinking it for years in the summer in France and so happy it’s finally being recognised as a “real wine” over here!) and I love the idea of this sangria as far too often it’s just too sweet. This looks perfect for the warm weather. Bookmarked! I love my friends, NO (more) to Irish pub Sangria! Lol.